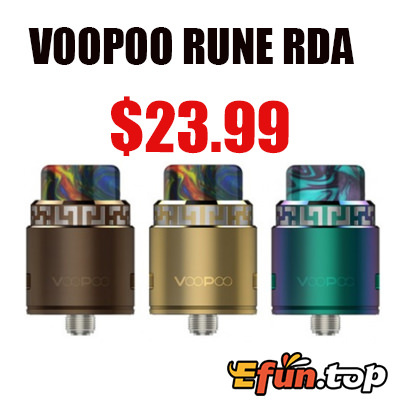 VOOPOO RUNE RDA is the latest RDA from VOOPOO. The electrode-mast-free base of RUNE allows for maximum E-liquid capacity. Features the vertical coil connecting system that will make DIY simpler. Moreover, VOOPOO DUNE is compatible with both squonk and usual pin, and it is best to pair with any squonk mod on the market. Besides, you can change the 810 or 510 resin drip tip at random.